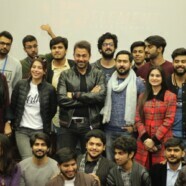 Forman Journalism Society is known for its well established repute of interactive sessions and yet again they managed to hold another session with the cast of Pakistan’s upcoming release “ARTH The Final Destination” under the supervision of Society’s advisor, Syed Muhammad Saqib and Chairperson Mass Communication Department, Ms Rachel Hasan. The very famous Shan Shahid and Uzma Hassan along with the entire faculty of Mass Communication department graced the occasion with their presence, being held in S-009. The event started off by showcasing the movie’s trailer and dance performances. 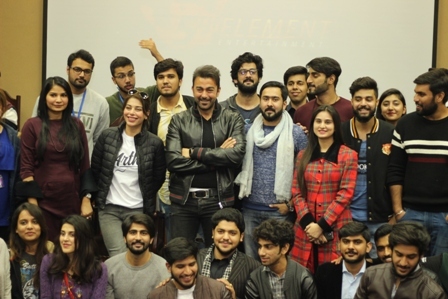 Later Shan and Uzma were invited on stage where they talked about their startups in the acting career and their experience throughout the filming of Arth. Shan spoke about how it is important to conquer the world and finding your passion because miracles do happen every day. He also added “Nurture your gifts and follow your dreams”. Uzma also shared her first experiences in the acting field and gave a brief introduction of her character in the movie. 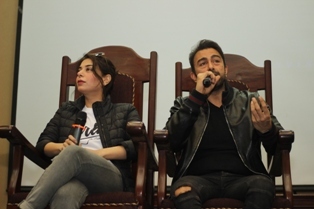 Both the actors emphasized on the improvement of acting by introducing the idea of academies for filming and that institutions should offer courses that focus entirely on filming and acting. Later, students were given the opportunity to ask questions from the celebrities. In the end, Shan Shahid added that “When you die, it is only you. When you’re alone, you’re the director of your own life. No one else is there, so share happiness, share passion”. Students of FCCU were really motivated and showed complete enthusiasm towards the answers to their questions.